For 23 years the basket sat on my parent's coffee table. When I visited them I saw the basket. Then, when they passed away my daughter took the basket to her home where it ended up on the top of the bookcase to protect it from a toddler and cats. It was 6 years before I saw it again and became re-inspired by the finer technique. 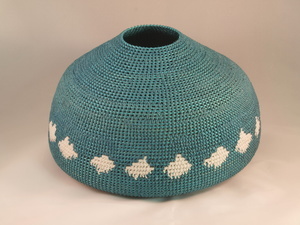 After seeing an Exhibit of Georgia O'Keefe paintings at the Denver Art Museum, I became fascinated with the idea of sky and clouds and started to create more graphic baskets. The new series is a combination of the 2 influences.